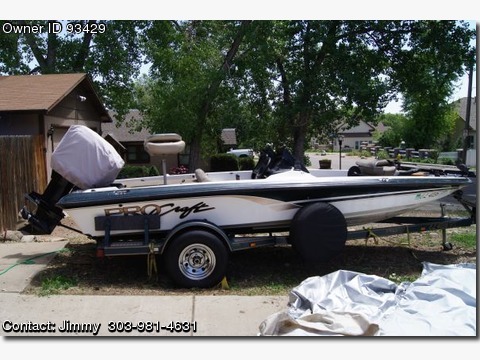 Call Boat Owner Jimmy 303-981-4631. Approx 8 hrs on Merc 150. Very nice 2001 Pro Craft Pro 185 Bass Boat with very, very low hours (about 8) on the motor since new. The skeg on the bottom of the motor should give you a hint. This boat will do 60+ MPH on Big Mac in Nebraska or 55+ MPH locally depending on which of the two included Stainless steel props you use. Brand new carpet and seats recovered about a month from the date of this ad. Comes with a mounted 67 lb trolling motor. Cockpit has depth sounder, MPH, RPM, Trim and fuel gauges. Two live wells, ice box and two rod storage and miscellaneous storage in the rear which is where I mounted the two bank charger. Two newer deep cycle trolling batteries and a new starting battery. I've only used about a third of a tank of two cycle oil from the tank since new. Very fuel/oil efficient motor for the awesome power it produces. The trailer has 3 new tires. Lots more pics available upon request. Contact Jim at three 03-981-4631 or oojimmyc at aol.com. No scammers, representatives, paypal account BS please.